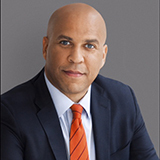 CHICAGO — Rising United States Senator Cory Booker — known for being innovative and widely recognized as the accessible and energetic new voice of politics — will join ALA President Sari Feldman as speaker during her President’s Program at ALA Midwinter Meeting in Boston. This program, in partnership with the ALA Task Force on Equity, Diversity, and Inclusion, will take place from 3:30 - 5:30 p.m. on Sunday, Jan. 10. Senator Cory Booker is deeply connected to the people he serves and their daily challenges and makes the case through his work, and in his forthcoming book "United," that connection and compassion must guide our nation toward a brighter future. He chose to live in the projects of blighted Newark, New Jersey and on food stamps in order to better understand the experience of poor families and took Hurricane Sandy victims into his own home. As mayor of Newark from 2006 to 2013, he was the public face of a city that had gone years without positive national attention and became the first black Senator from New Jersey in 2013. As Senator, he has been persistent and put partisanship aside, bringing people together to get things done for his state, including a focus on creating new jobs and addressing the economic squeeze facing the middle-class. Join us to hear his insights on economic growth, civic engagement, individual opportunity and community progress. Senator Booker, whose regular following includes 1.5 million on Twitter and 50,000 on Instagram, writes with passion on issues including equity, inclusion and economic justice. You can read more about him on his official website. His appearance at ALA Midwinter Meeting is sponsored by Penguin Random House. Bundle registration for 2016 ALA Midwinter Meeting and ALA Annual Conference is open through September 30. 2016. ALA Midwinter Meeting-only registration and housing open at noon (Central) on Oct. 1, 2015 at alamidwinter.org.